May 28, 2015, 8:09 p.m. In the last few years, Americans have turned away from military engagement: despite continuing troubles in Iraq they believe removing U.S. troops in 2011 was not a mistake (while sending them there in the first place was). In the latest Economist/YouGov Poll, most say the United States has no responsibility to do anything about the fighting taking place in Syria. But their opinions change when they are asked whether the U.S. has a responsibility when it comes to fighting ISIS there. Republicans, Democrats and independents agree when it comes to the principle of taking or not taking sides in Syria, and independents especially opposed (59% of independents believe the U.S. has no responsibility there; just 22% think it does). But all political groups take an interventionist position when it comes to fighting Islamist militants like ISIS. Republicans in particular say the U.S. has that responsibility, by a three to one margin. More than a third of those opposed to U.S. military responsibility in general change their minds when the matter of ISIS is raised. ISIS is now more feared by Americans than Al Qaeda, as has been the case at least since an August 2014 Economist/YouGov Poll. Last year, 49% described ISIS in Iraq as an immediate and serious threat to the United States. Now, 57% say that. 55% say the same about the threat from ISIS in Syria. Most Americans view Al Qaeda as at least a somewhat serious threat to the United States, but just four in ten say that threat is “immediate and serious,” fewer than view ISIS that way. As before, Republicans are somewhat more worried than Democrats about ISIS and Al Qaeda. The ISIS threat in Syria and Iraq is one that is growing. 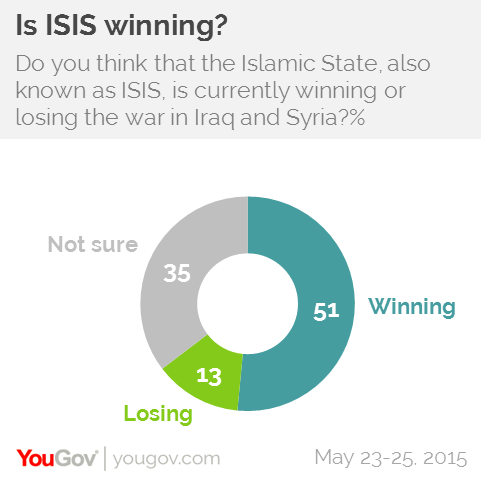 By nearly four to one, Americans describe ISIS as “winning” in those countries. 55% say ISIS is more powerful today than it was just six months ago (one in four see no change, and less than one in ten think it is becoming less powerful). 55% also see ISIS as gaining territory. Americans bigger concerns about foreign threats today are not those coming from other countries, but those from non-nation based terrorist groups. While majorities continue to express concerns over countries like Iran, Russia, China and Syria, far fewer view them as immediate threats as say that about ISIS and Al Qaeda. The increasing reach of ISIS on the ground in Iraq and Syria may be changing how Americans view the U.S. role in that battle. However, even though a majority of the public believes the U.S. needs to do something about the ISIS threat in Syria, most Americans put limits on what that something should be. 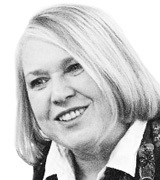 There is still relatively limited interest in sending in U.S. ground troops. 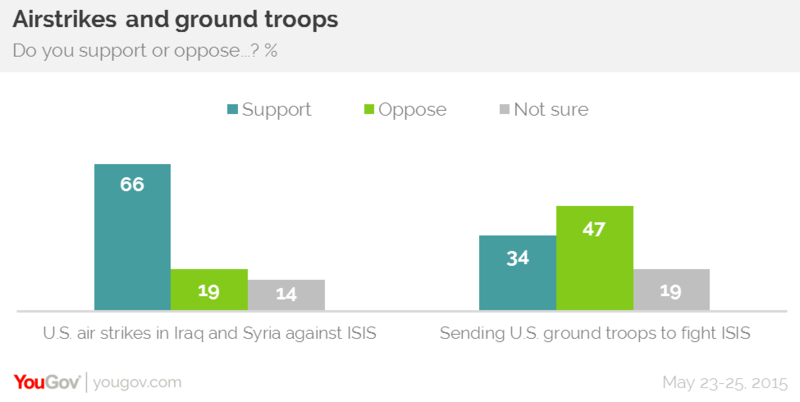 Two in three support air strikes, an option that received about the same amount of support last year. Republicans are more likely to support both these options than are Democrats and independents. More than six in ten Democrats favor airstrikes, compared with 80% of Republicans. Nearly half of Republicans would support sending ground troops, something only a quarter of Democrats would favor. But there is more support now than there was last summer for sending weapons to the moderate rebels in Syria, presumably in the hope that they could confront both ISIS and the government of Bashir al-Assad (whose personal favorable rating in this poll is just 9%). 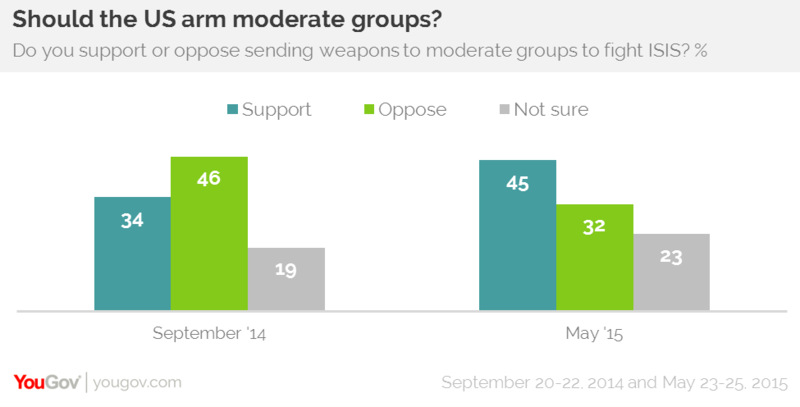 Support for sending arms to moderate rebels has jumped among all political groups, though it is slightly higher among Republicans. 52% of Republicans would send arms, and so would 46% of Democrats.